Crystal chandeliers can brilliantly showcase your home, bedazzle the eye, and add sparkle and style - unless they're dusty. Whether you have a Waterford Crystal chandelier, a fabulous ornamented Bohemian crystal chandelier, an antique Baccarat chandelier, one of the many magnificent period designs by Schonbek, or a prized family heirloom, we will very carefully clean the prisms and crystals to reflect the original splendor and opulence. We recommend a thorough cleaning at least once a year to keep your chandelier sparkling and brilliant! Dust your chandelier regularly with a non-shedding duster to remove the tiny particles that collect everyday. Crystal needs cleaning when it appears dusty or dull. For a quick spruce-up, clean and polish your bulbs. The difference is amazing. Do not put crystals in the dishwasher. Crystal chandeliers first appeared in the sixteenth century and were made with irregular shaped rock crystal. By the late seventeenth century glass, rather than rock crystal, became the preferred material, however the term "crystal" has persisted in the chandelier vocabulary. Crystal is a transparent glass of high optical purity and brilliance. The fire and beauty comes from the refraction of light passing through a prism. 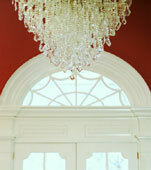 Note: Price will vary depending on size of chandelier and amount of time estimated for cleaning.